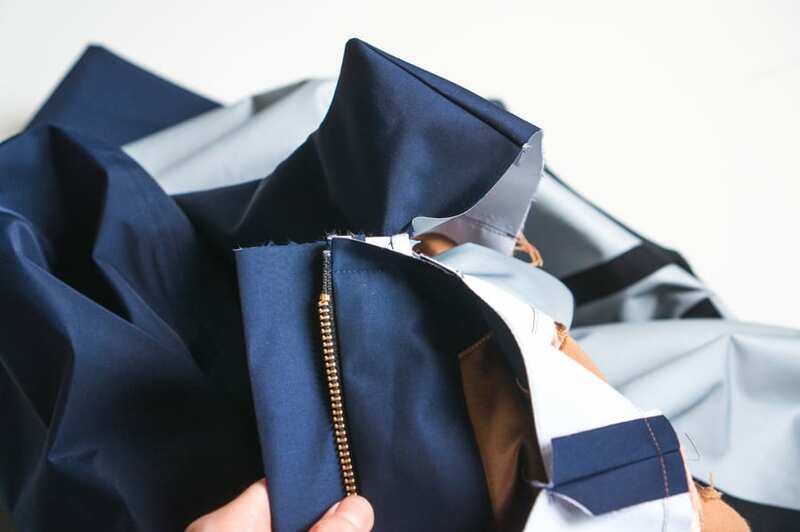 Your jacket lining should be assembled and ready to attach to the outer jacket. The lined hood should also be ready (if you’re making the collar, follow the construction details in our instructions). 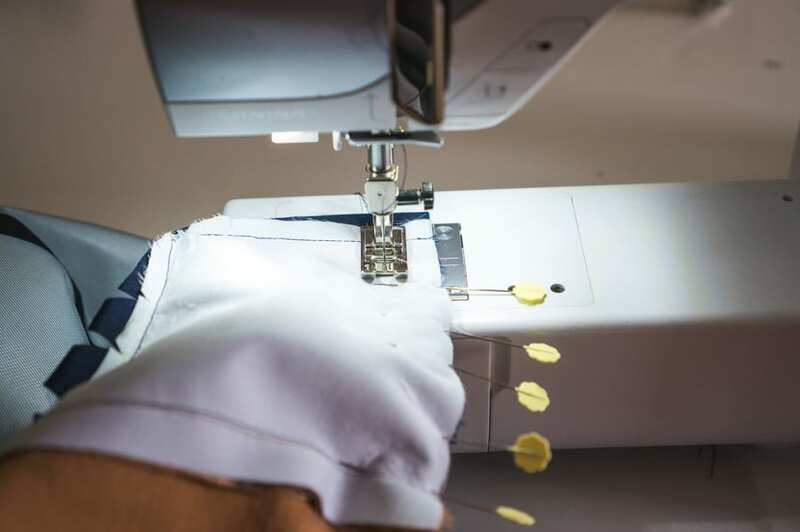 Press the hem of the outer jacket up by 1 1/2″; note that it is only possible to fold the hem up by 5/8″ near the right and left zipper facings- this is normal. The zipper facings on both right and left sides of center front are attached, with the inside edge free. With right sides together, match the raw edges of the lining to the raw edges of the zipper facings on either side. Start pinning from the neck down. 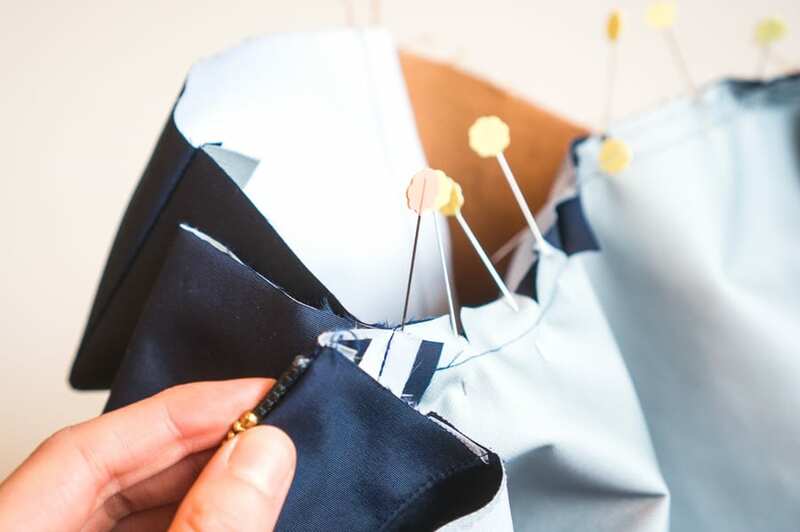 The lining should be 5/8″ shorter than the jacket at the bottom of the facings; the outer hem will be folded up and tucked over the lining hem at alater stage. And here is the lining pinned to the free raw edge of the left zipper facing. 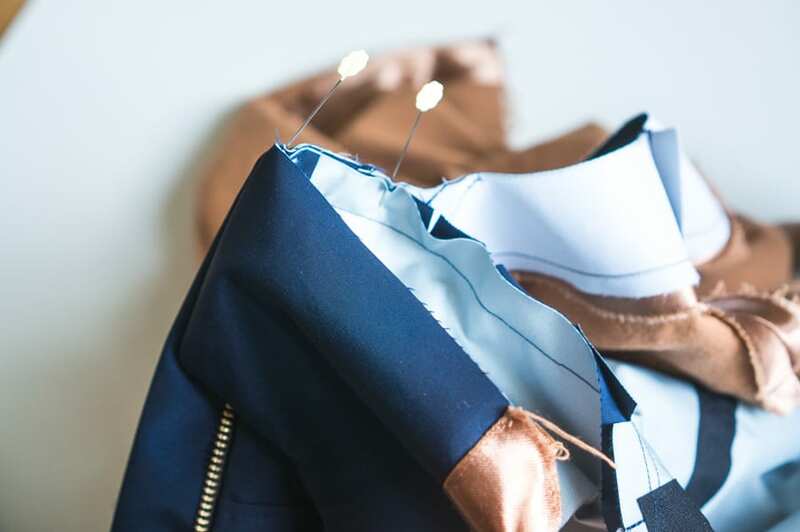 When you sew the lining to the jacket along the facings, you want to stop sewing about 3″ from the bottom hem on either side. You can draw in a small chalk line as a reminder before you start sewing. 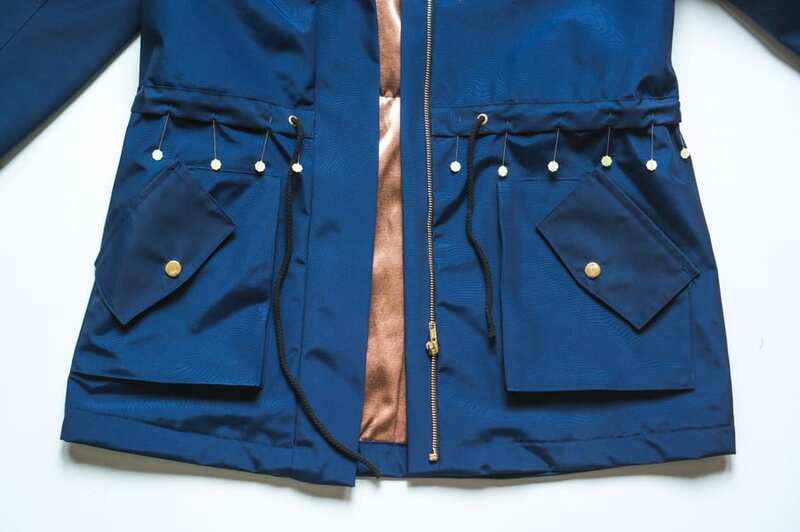 Stitch the lining to the jacket along the inside zipper facing with a 5/8″ seam allowance. ; repeat for both sides. 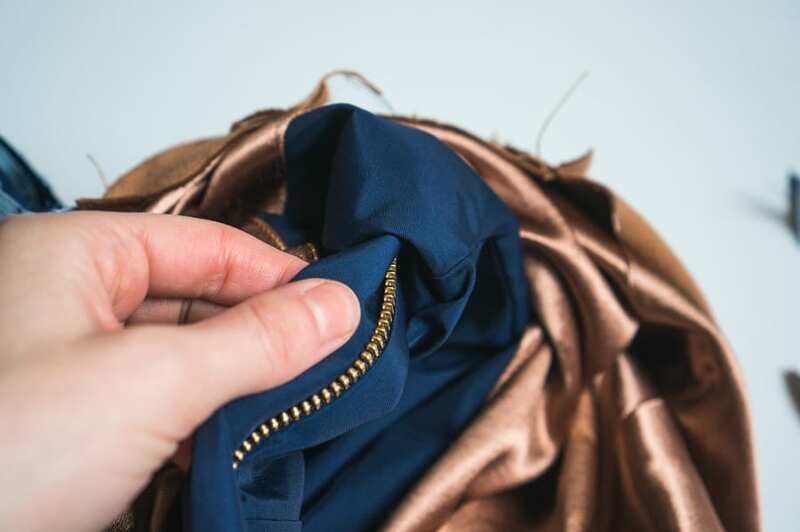 Press your seams towards your zipper (towards center front, in other words) and turn the jacket right side out. 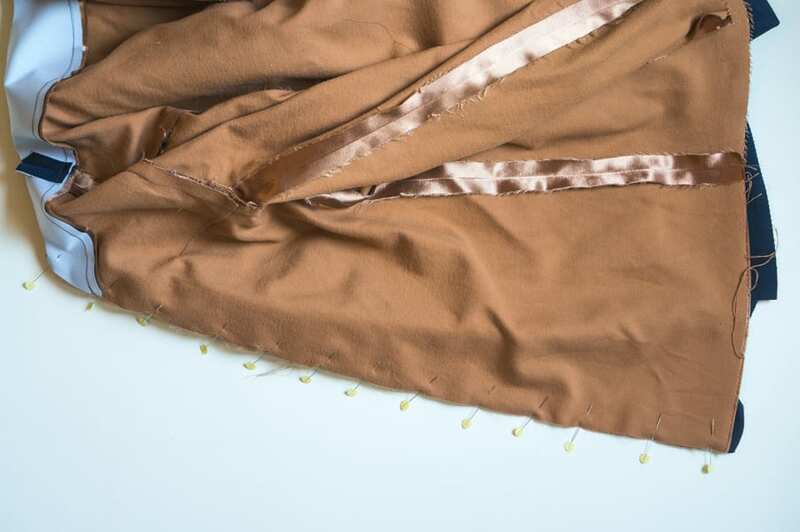 Understitch the lining to the facing by stitching 1/8″ away from the edge of the facing, sewing through the facing and lining seam allowance only. You will be sewing on the facing, not the lining. 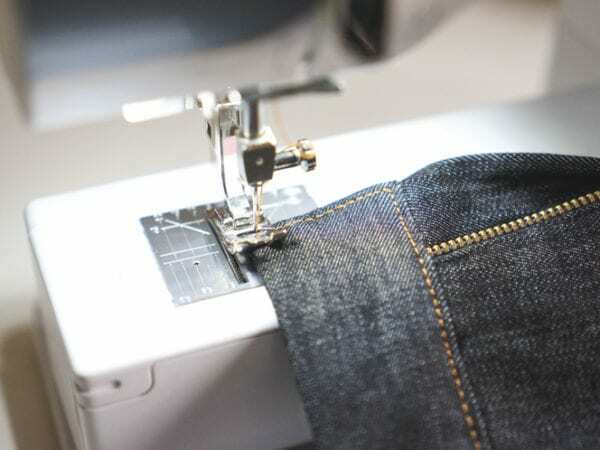 You will stop stitching at the same point 3″ from the bottom hem on either side. Repeat for both the right and left zipper facings. The next step is to attach the outer part of the hood or collar to the jacket. We have just photographed the hood in this example, but it’s the same process if you are attaching the collar. 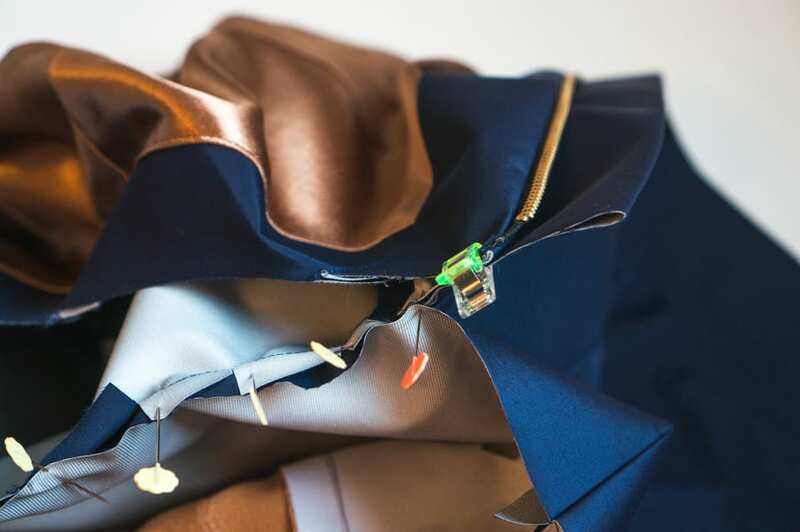 One thing to note; make sure the neckline of your coat and the edge of the hood facing and lining are staystitched. This will prevent these seams from stretching out in the steps below. 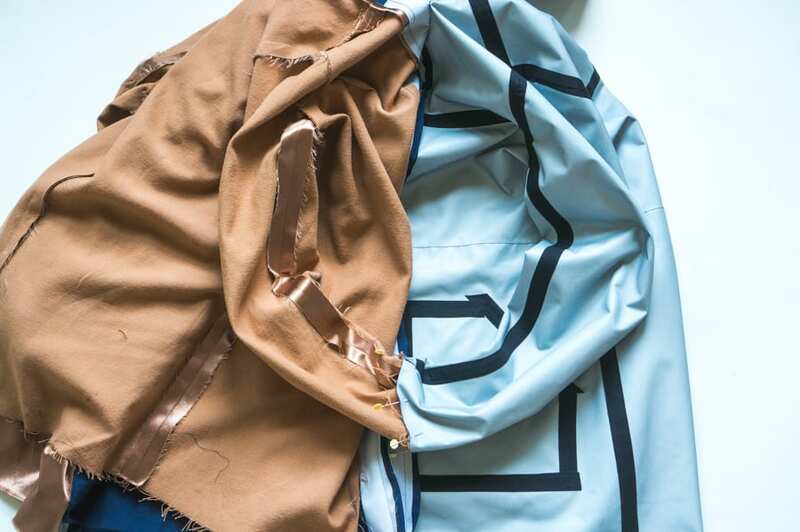 With right sides together, match the neckline of the outer hood to the neckline of the jacket, keeping the hood lining and hood facings free. 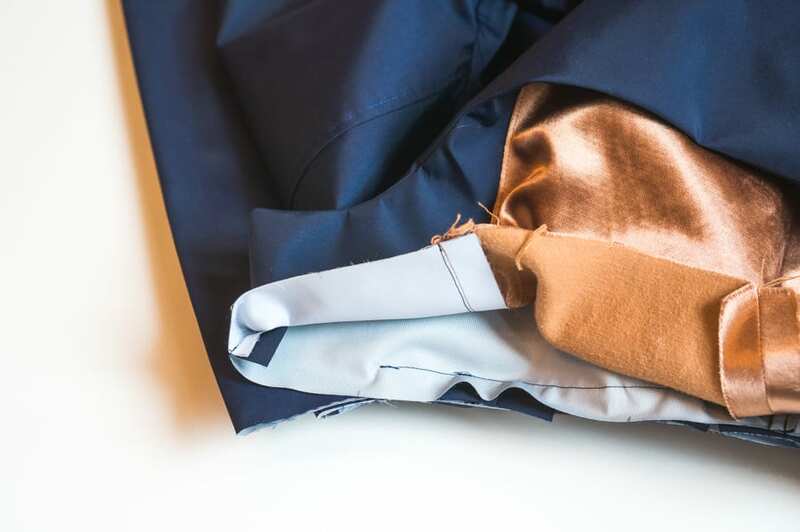 You may need to clip into the neckline of the jacket to help this seam line up; make sure you don’t clip past your staystitch line. 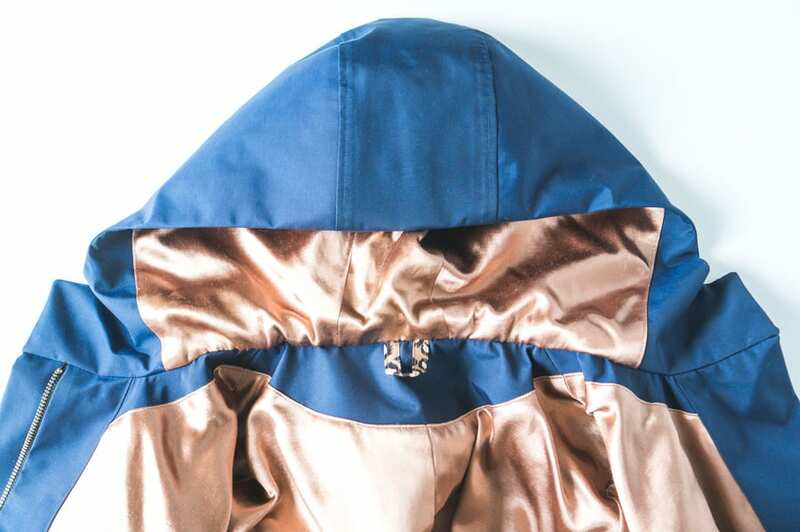 On the left side of the jacket, the edge of the hood lines up with the folded left zipper facing. 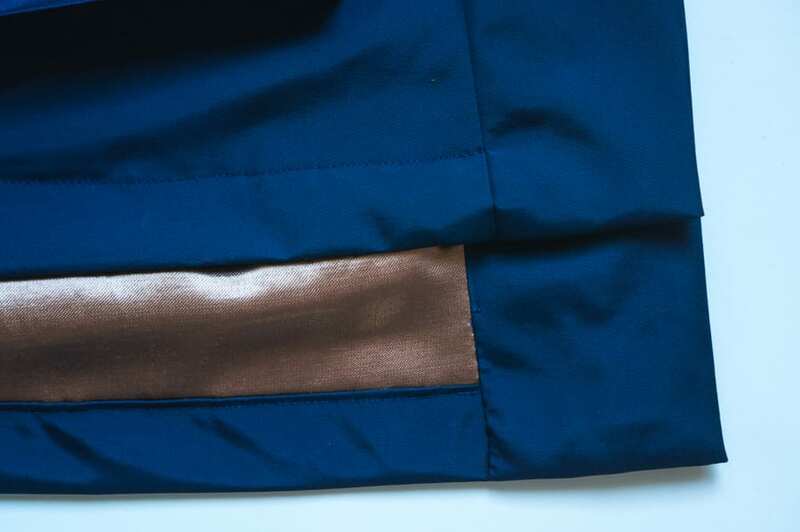 On the right side of the jacket, the edge of the hood lines up with the outer edge of the zipper placket. 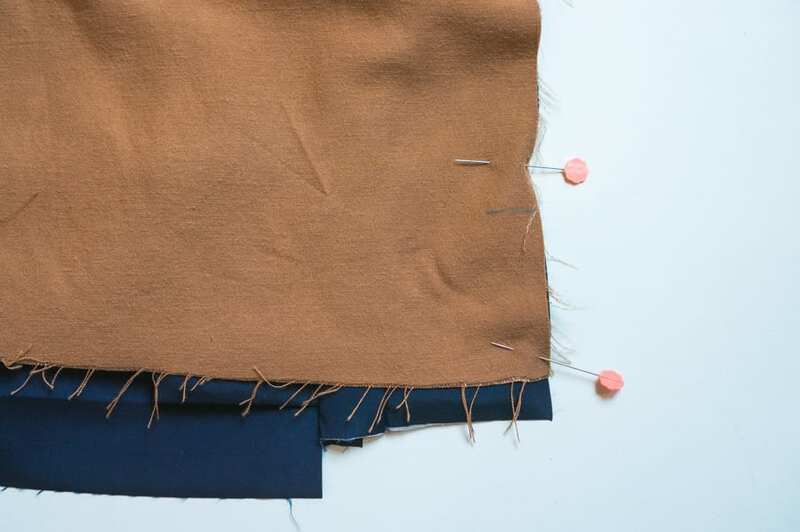 In the image below, I am holding the right zipper facings in my fingers, and behind you can see how the edge of the right placket will line up with the edge of the hood. 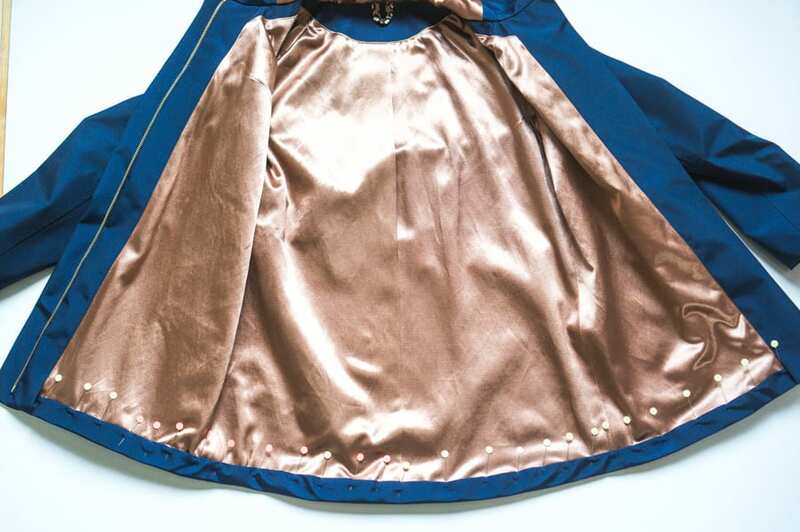 When you sew the hood to the jacket, you are going to stop sewing where the right zipper placket starts. I’ve put a little pink pin to mark this point, and I’ve got a green Wonder Clip holding the right zipper facing and placket together. 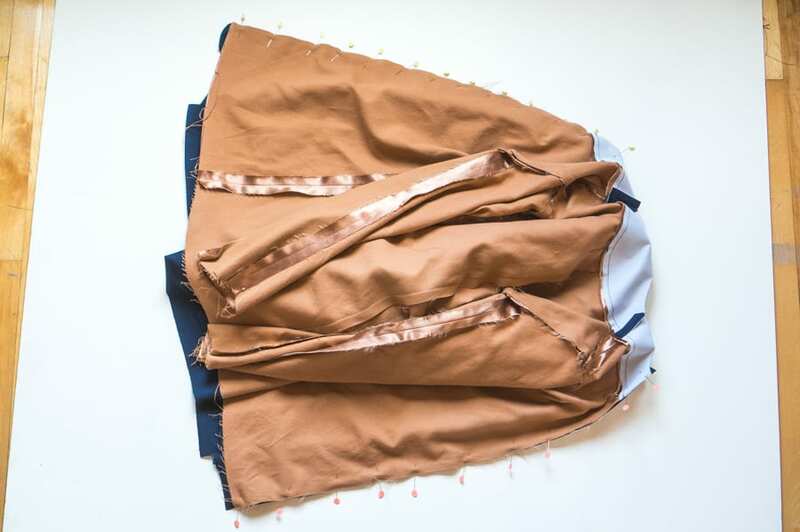 Start sewing from the left side of the jacket. 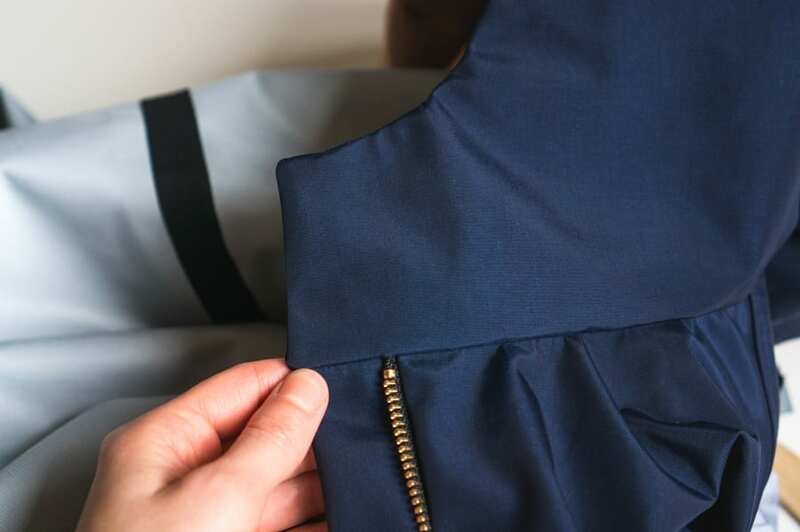 Keep the hood facing and lining free, and make sure the folded edge of the left zipper placket is resting flat. 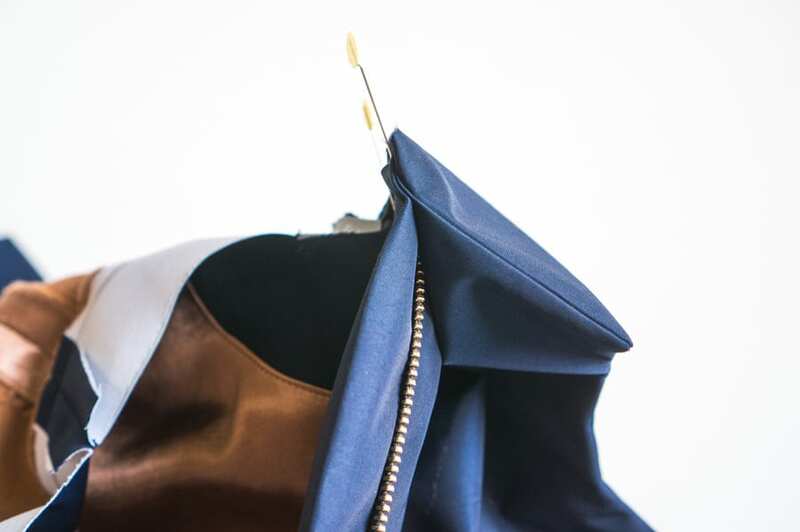 If you fold the hood facing slightly out of the way, you will be able to drop your foot and needle down as close as possible to the edge of the hood and left zipper facing. 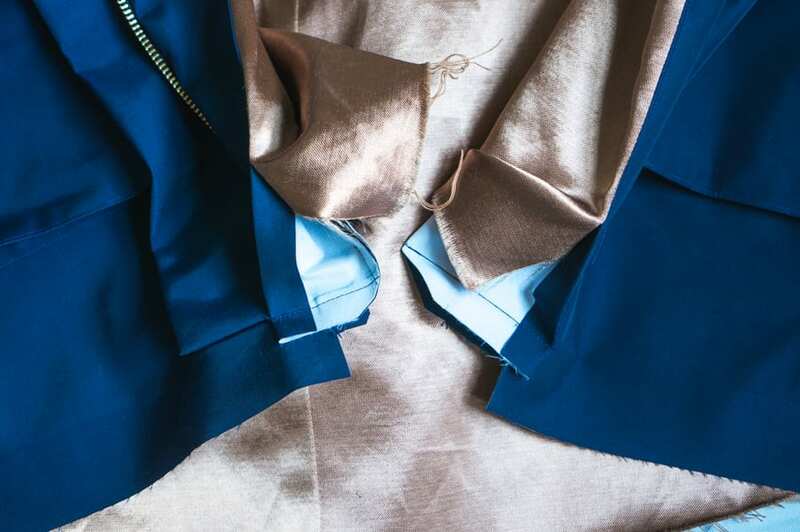 Continue sewing along the neckline until you reach the right side of the jacket, where the right zipper placket starts; I’ve marked it with the pink pin. Below you can see where I stopped sewing. Now it’s time to secure the hood facings to either side of the jacket. We’ll start with the left side as it’s a bit easier since we only have a facing to deal with. We’re going to wrap the hood facing around the neckline seam we just sewed. The left zipper facing will be sandwiched in between the outer hood and the hood facing. It’s a bit like securing the hood facings for the unlined Kelly Anorak, or attaching a collar stand to a Kalle Shirt. The only difference is this lined hood is a bigger piece of fabric to manipulate. 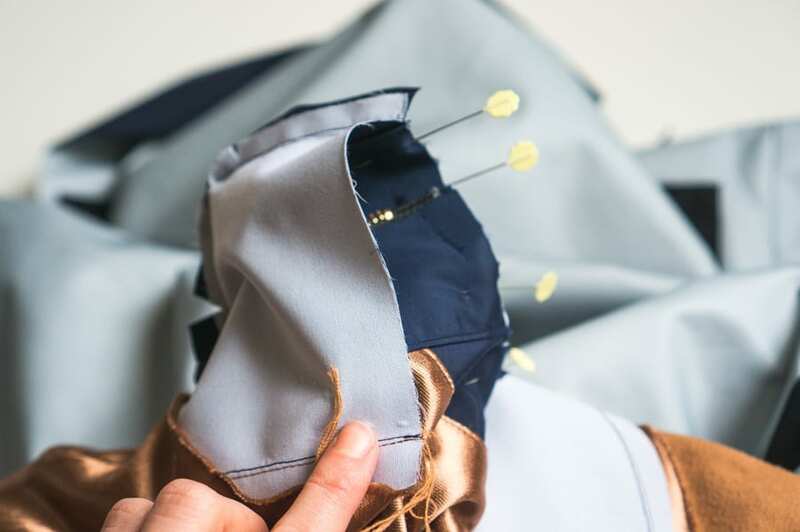 If you weren’t able to start sewing the outer hood to the jacket at the very edge of the hood at the folded edge of the left zipper facing, pin these edges together carefully so they act as one and don’t shift out of place. Now wrap the left hood facing around the seam. The right side of the facing will be touching the inside of the left zipper facing. 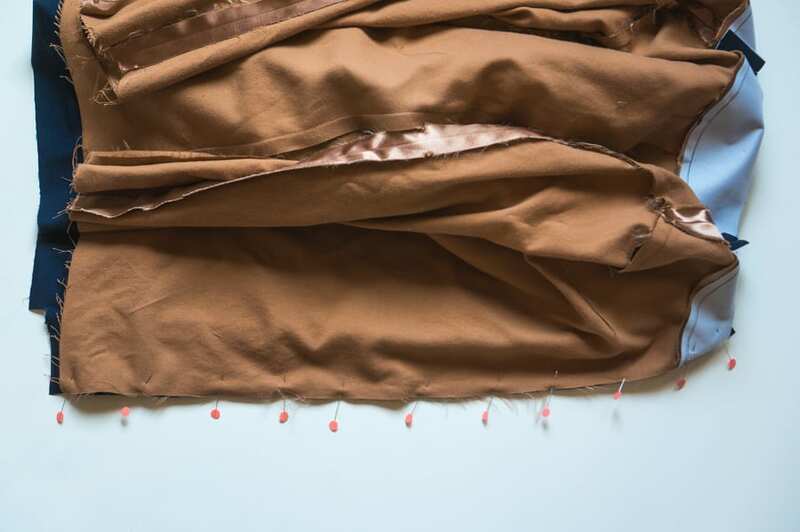 Pin along the raw edge, making sure everything is lined up and all the layers are resting flat against each other. Sew along this seam as far as you can. I like to sew using my existing stitch line as a guide. Clip the corner and grade the seam to make it easier to turn the hood right side out. Gently turn the hood right side out by pulling on the left zipper facing. Make sure the hood is attached to the jacket with no puckers. The jacket body should be now be neatly encased by the hood on the left side. This is what it will look like from the outside of the jacket where the hood is attached to the left zipper facing. The steps for securing the right hood facing to the right side of the jacket will be the same. The only difference is we’ll also be encasing the right zipper placket inside the hood. 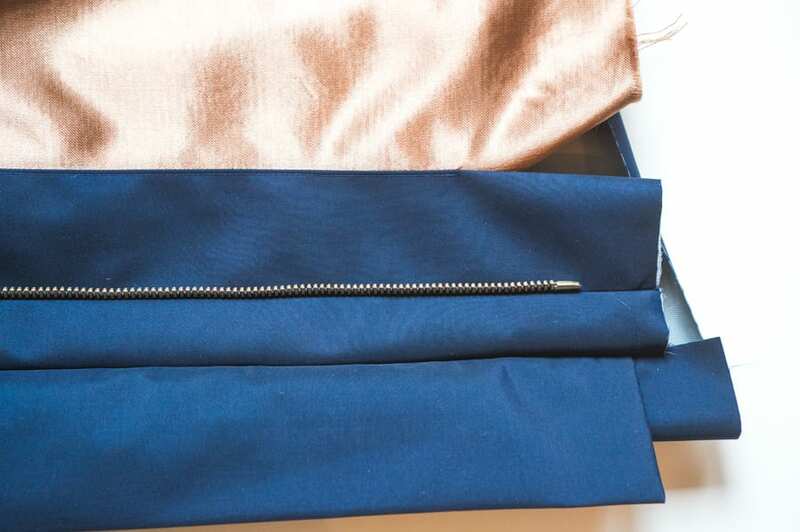 I’ve sewn a short line of stitches within the neckline seam allowance to secure the top of the right zipper facing to the right zipper placket, so it will act as one layer of fabric and be easier to handle. 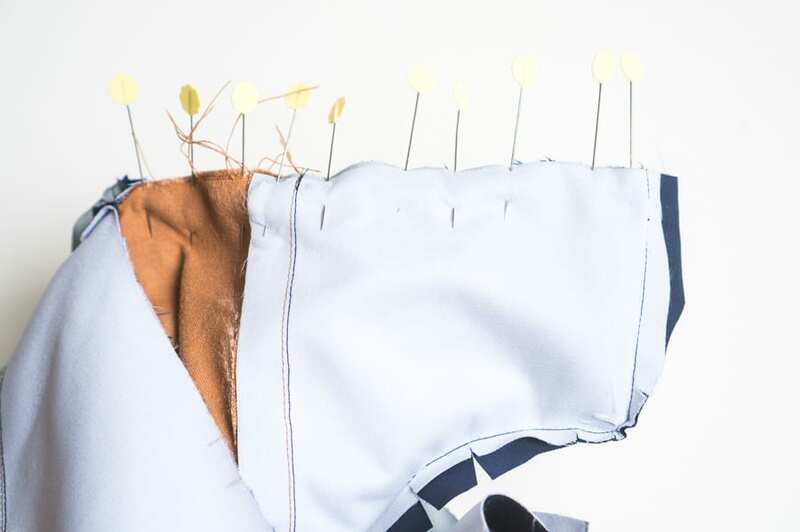 Pin the free part of the outer hood in place to the right zipper placket, matching the edge of the hood to the edge of the placket. 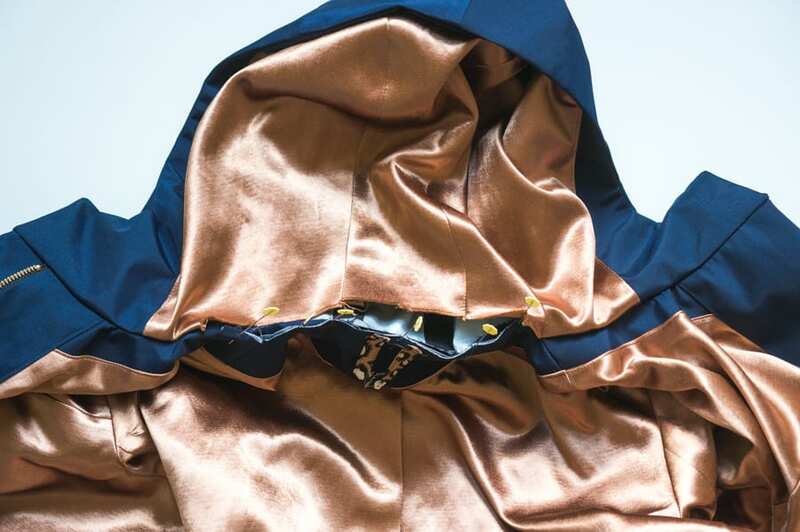 Wrap the hood facing around the neckline seam, sandwiching the zipper placket and facing between the right hood facing and outer hood. Pin in place, ensuring all the layers are resting flat. Sew along the neckline seam through all the layers, as far as you can. Clip the corner and turn the hood right side out. 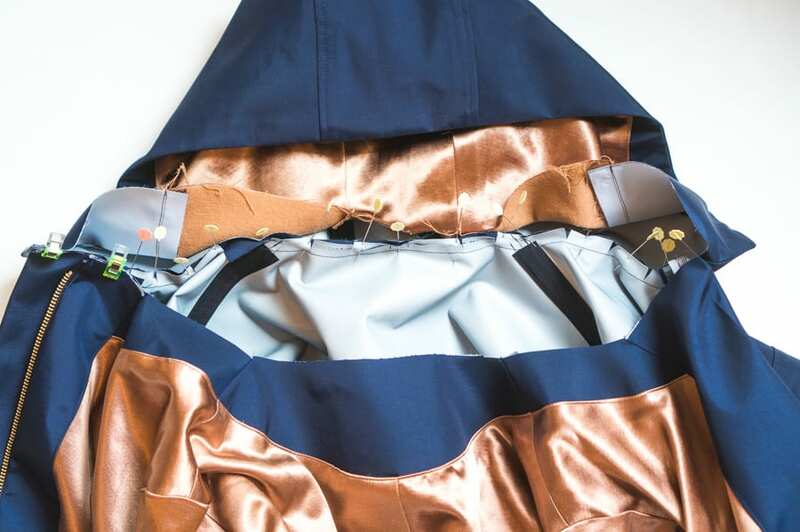 The hood is now almost completely attached to your jacket, except for an opening along center back where the hood lining and neck facings have not yet been secured. We need to leave this section of the hood open for now since we will need to turn the jacket inside out again for the next few steps. 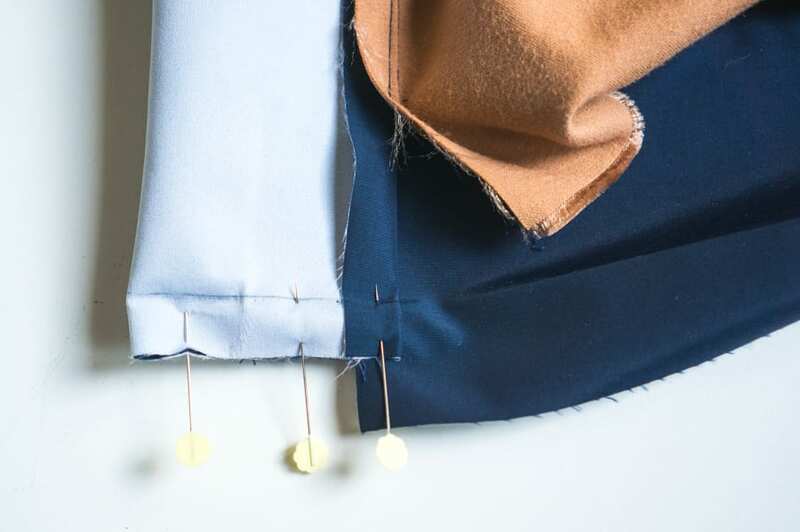 Turn your jacket inside out to finish the bottoms of the right and left zipper facings. 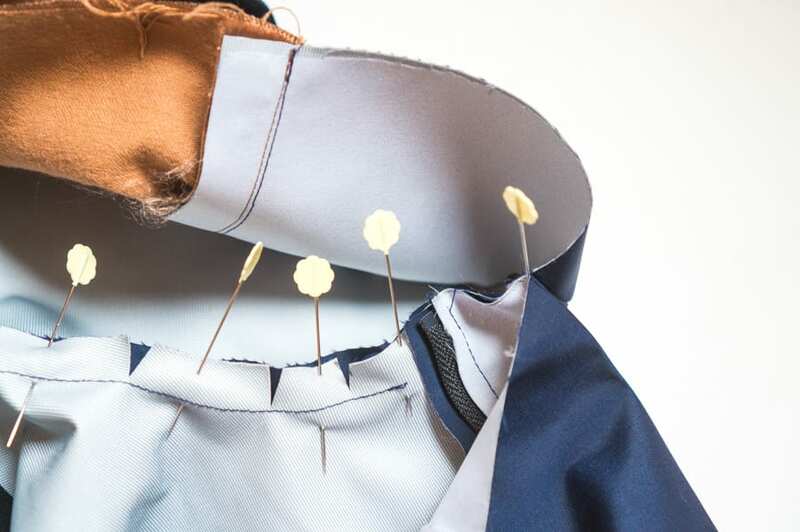 On the right side of the jacket, fold the top and bottom right zipper facings in on themselves with right sides together along the seam where the zipper has been sewn in. 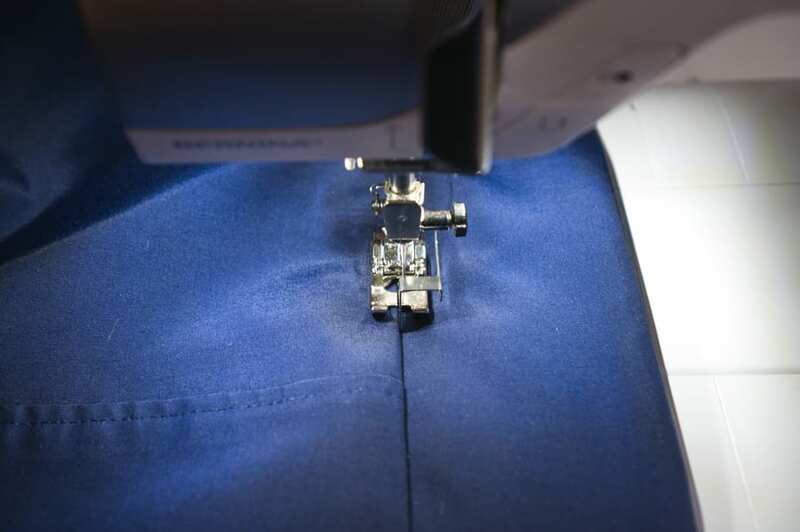 You can fold the right zipper placket and lining out of the way so they won’t get stuck in your stitch line. I’ve drawn in my stitch line along the 5/8″ seam allowance. 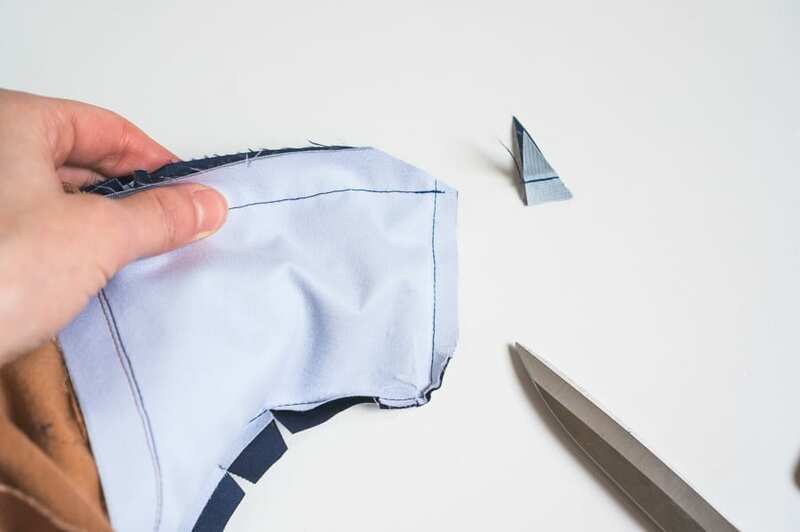 Repeat for the left side of the jacket by folding the left zipper facing in on itself with right sides together along the fold line. Stitch along the bottom of each facing to secure in place, and clip the corners so you’ll have a nice sharp corner when the facings are turned right side out. 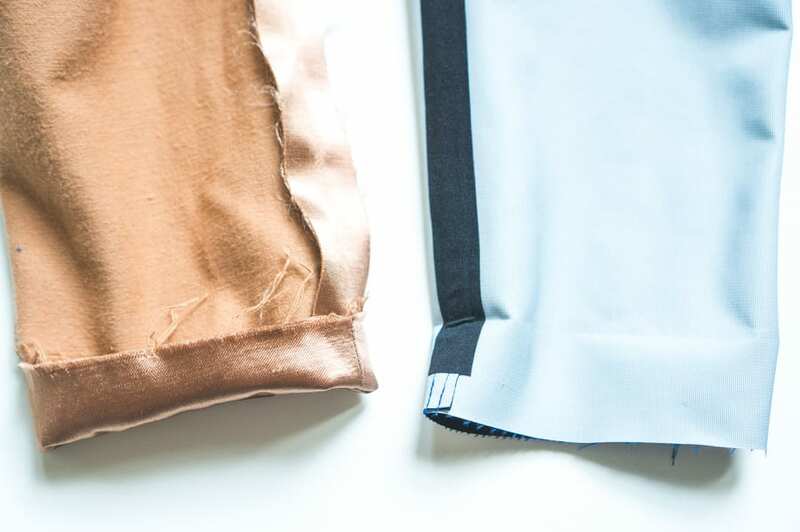 The stitch line should line up with the 1 1/2″ hem you pressed earlier. The next step is to attach the lining sleeve to the outer sleeve. With your sleeves inside out, press the sleeve cuff of the outer jacket in by 1 1/2″. Fold the lining sleeve cuff seam allowance up about 1/2″, but don’t press. 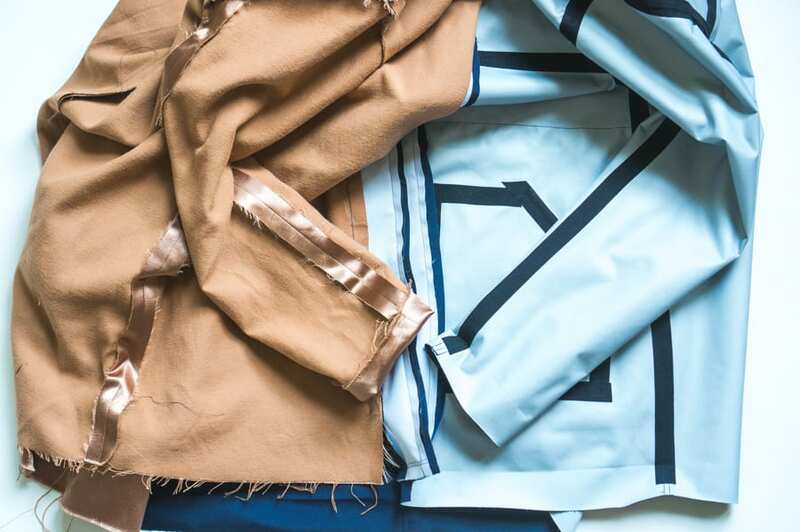 Match the outer sleeve to the lining sleeve. Make sure the sleeves are not twisted and that the top and bottom sleeve seams match. 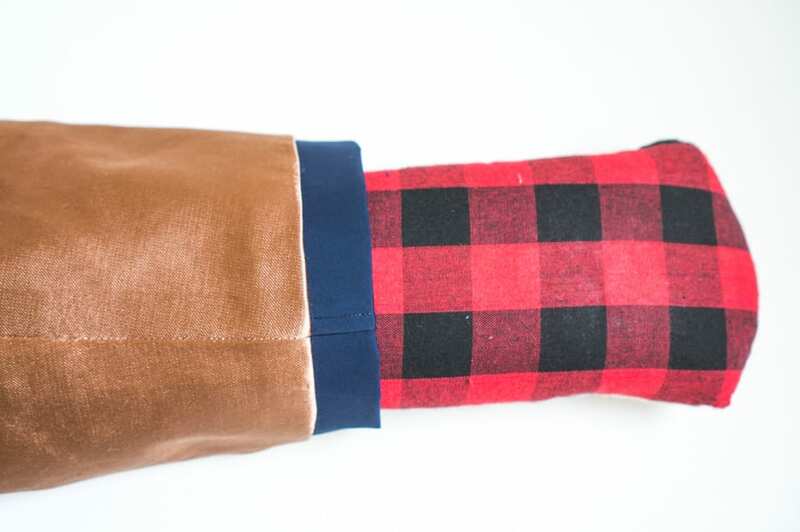 With right sides together, pin the lining sleeve cuff to the outer sleeve cuff. 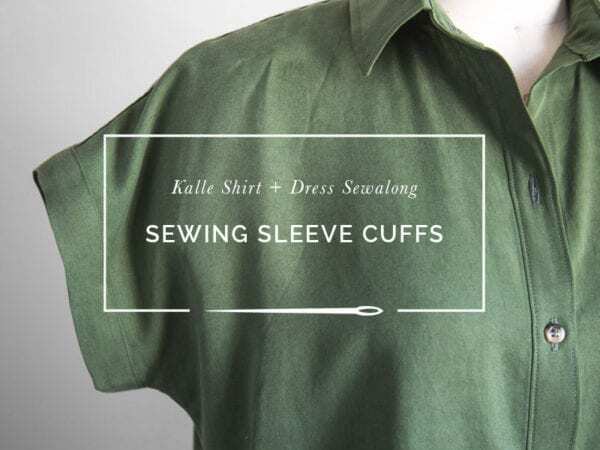 Sew around the circumference of the sleeve cuff at 5/8″. 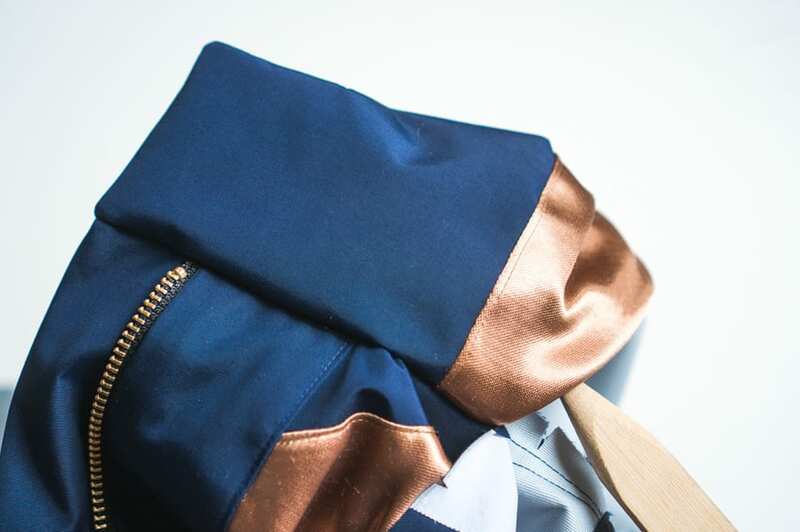 When you turn your jacket right side out, the sleeve lining will slip inside your outer sleeve. Give the sleeve cuff a nice press. The neckline and hem of the jacket still need finishing. If you’d like to add a hanging loop, baste it to center back of your neck facing now. 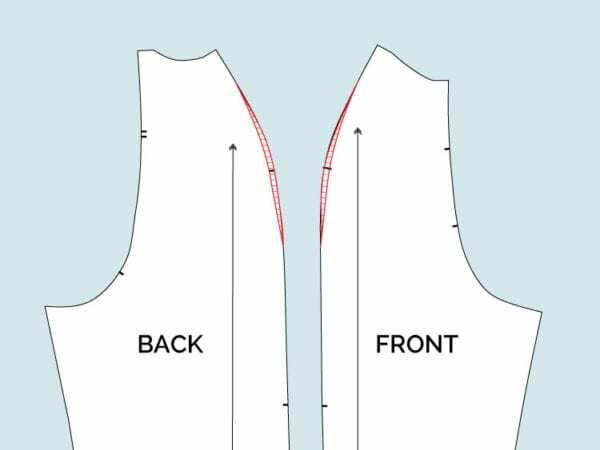 Please note that we did not staystitch our neckline down as we suggested above; these areas should be staystitched! 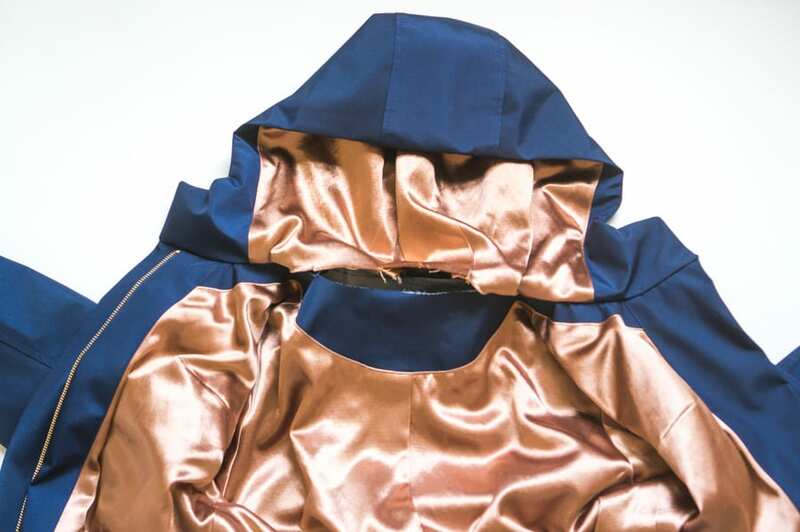 The hood is attached to the outer jacket body, but the hood lining and the neck facing have not yet been secured. Pin the neck facing to the neckline seam allowance of the jacket and sew together so it will act as one layer. You can turn the hood facings inside out again if you are having trouble sewing close to the existing neckline stitching. The hood lining/facing is still free at this stage. 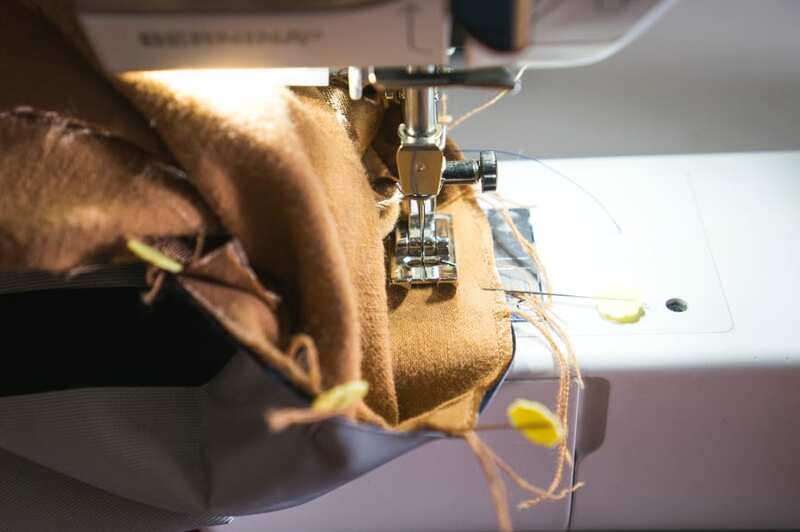 Press the seam allowance of the hood lining in by 5/8″ along the neckline. 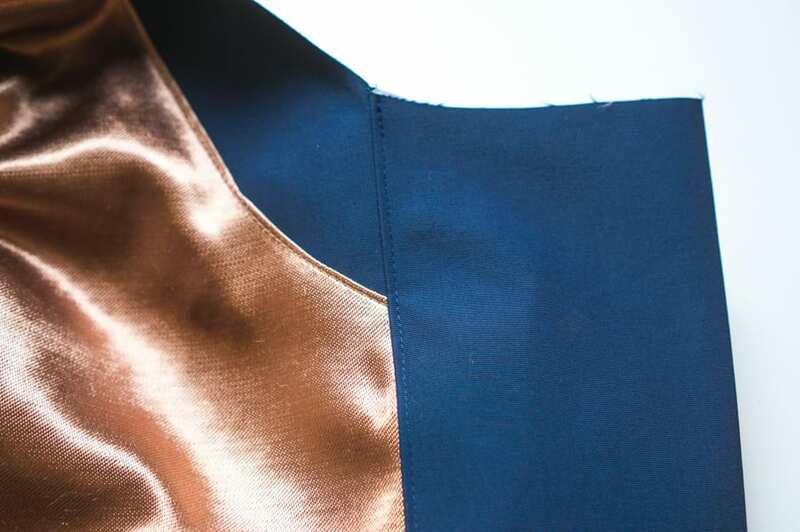 Because we forgot to staystitch here, our lining had stretched by the time we reached this step, so it was hard to ease the lining into the neckline. 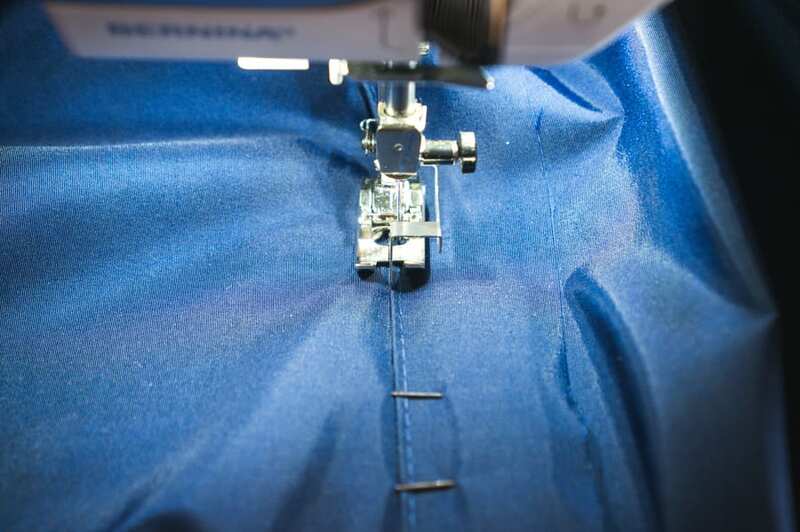 We sewed a line of basting stitches in by hand to help gather the lining to ease it in to the stiffer waterproof fabric. 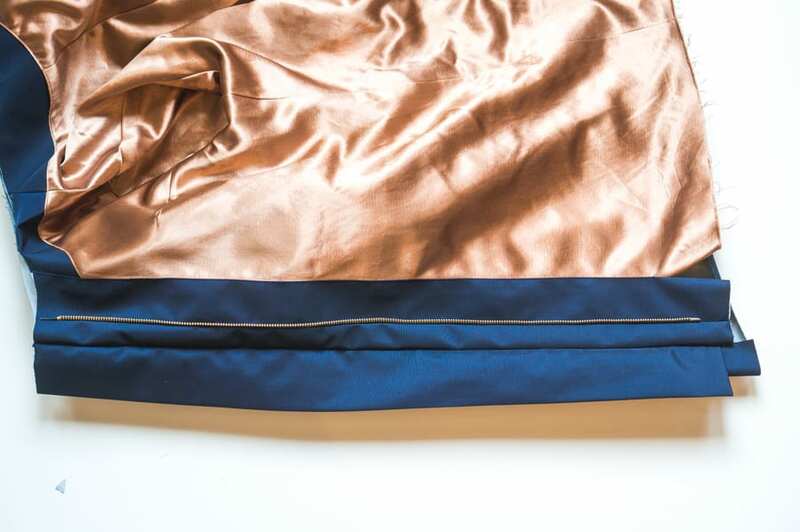 Even if you staystitch you may find you need to ease the fabric in with some basting stitches since the lining is much lighter and less stable than the interfaced neckline facing. 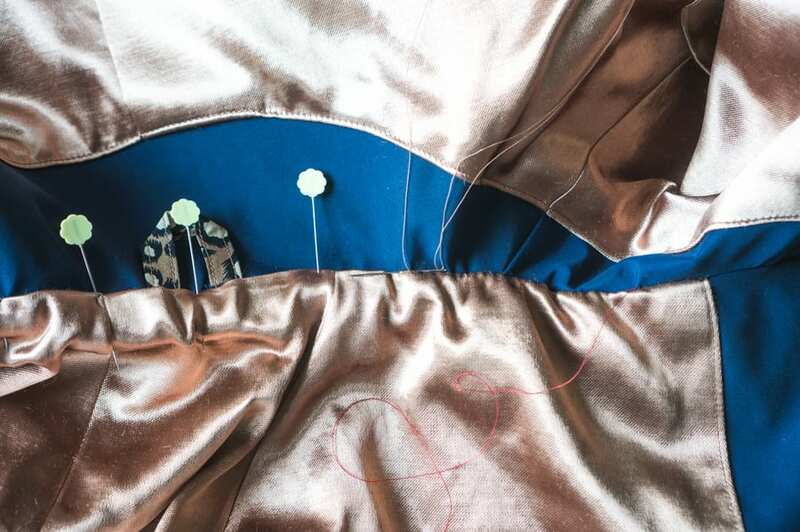 Pin the lining in place and slip-stitch the lining to the facing. Pull out the basting thread afterwards. Give the hood a nice press. If you like, you can topstitch just above neckline of the hood to secure everything in place. 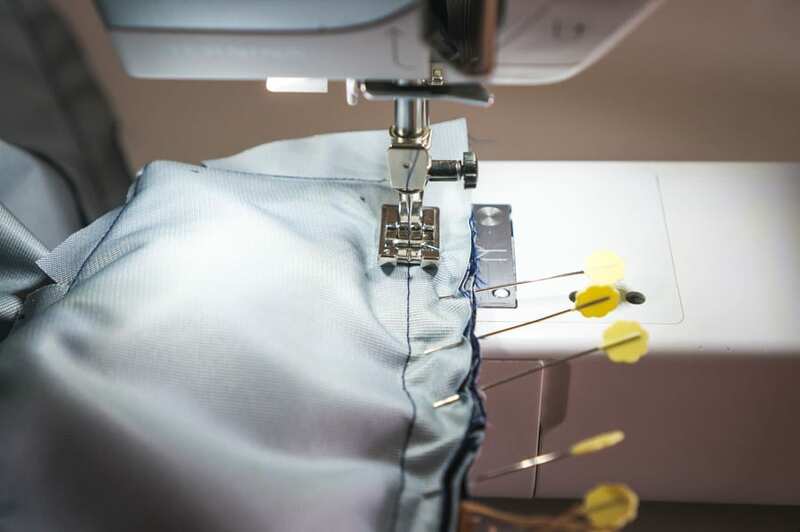 To finish the hem, turn the left and right zipper facings right side out, using a point turner to help shape the corners. 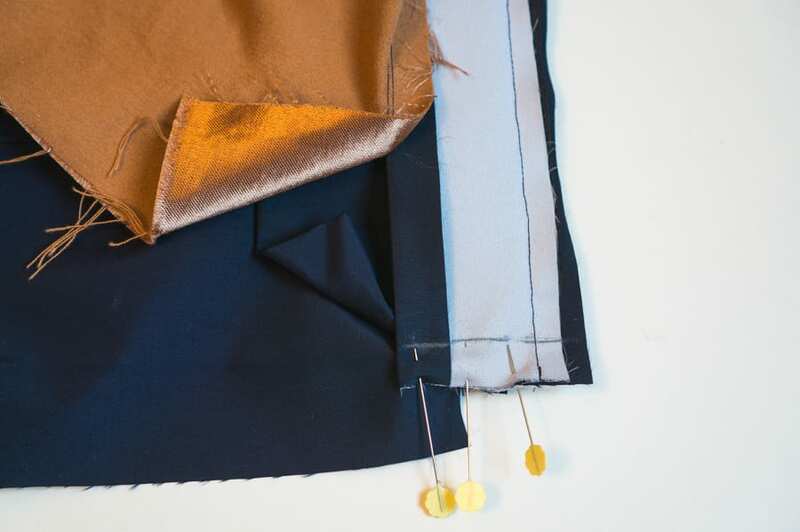 Press the bottom hem of the jacket in by 1/4″ or finish with bias tape. Lay the jacket flat and match the side seams of the jacket and lining. 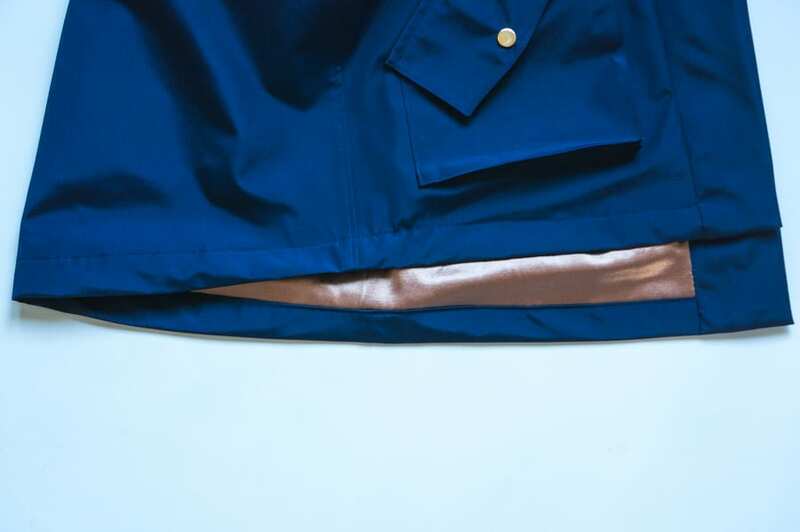 Align the raw hem of the lining so it stops at the folded crease of teh outer jacket. 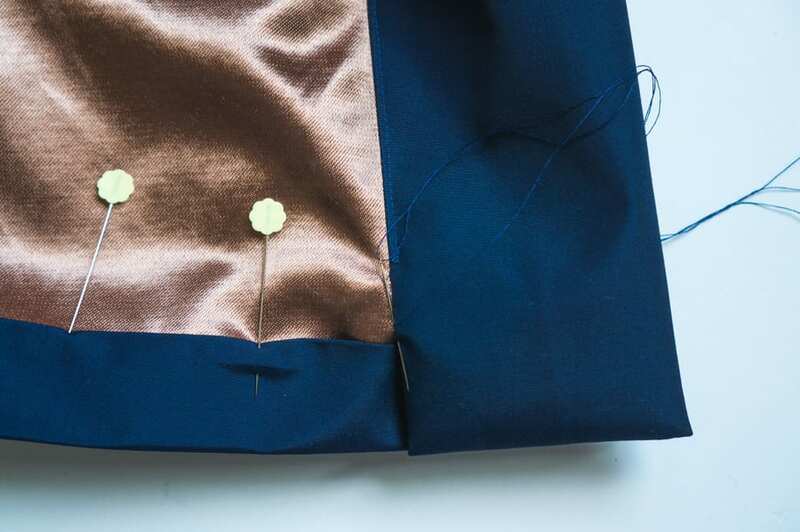 Fold the hem of the outer jacket up over the lining along the first line you pressed and pin in place. 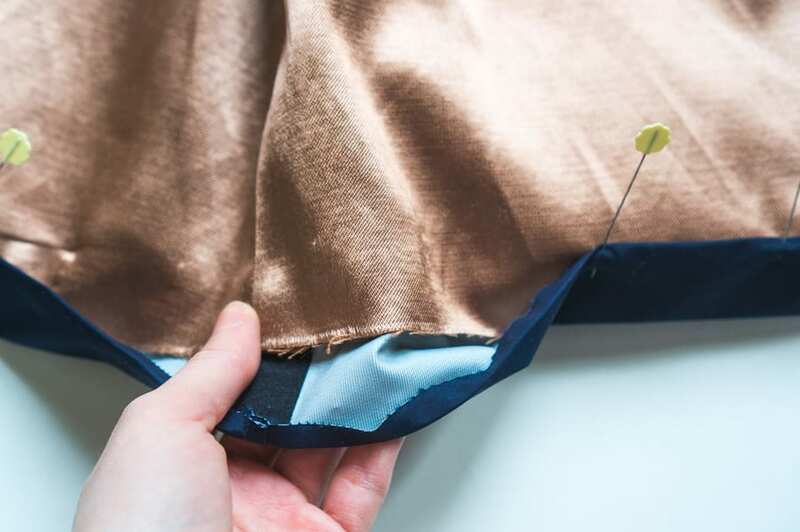 When you pin the hem in place, make sure the lining is smooth and evenly placed. 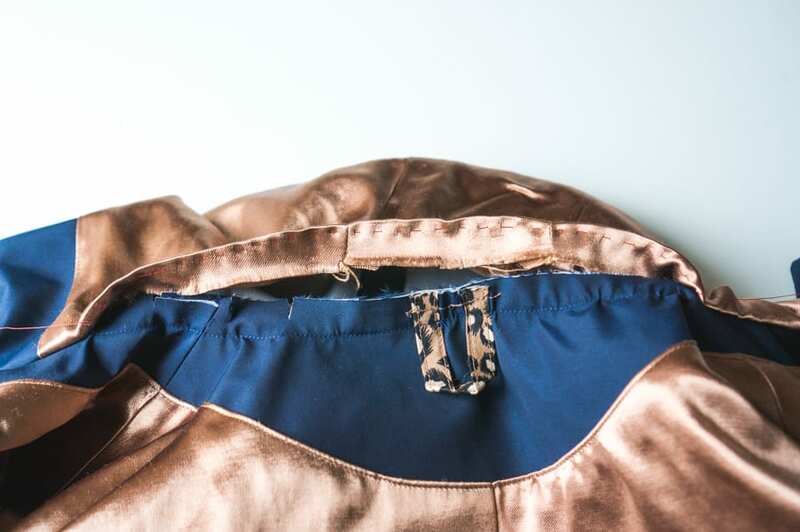 There are a few inches along the bottoms of the left and right zipper facings where the facing is not secured to the lining. Smooth the corners of the lining down under the turned up hem and slipstitch the facing to the lining. Repeat for the right facing. Topstitch the hem of the jacket into place. 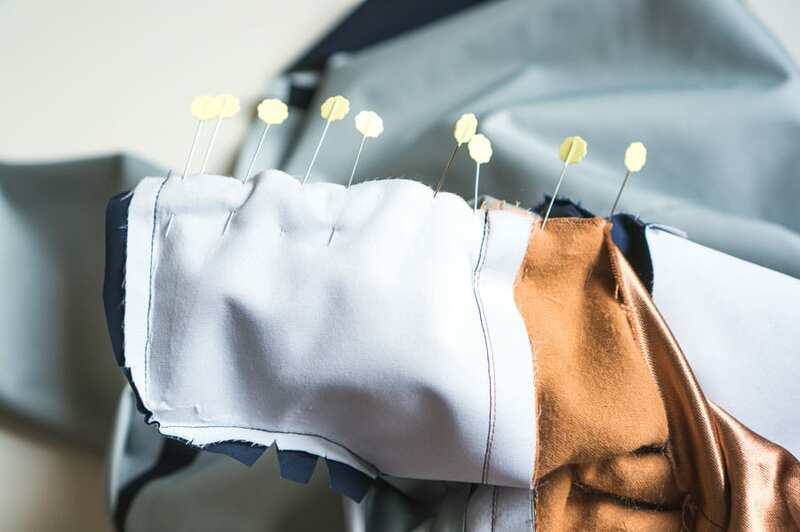 Start stitching after the placket seam on the right side of the jacket and stop stitching at the left zipper facing. 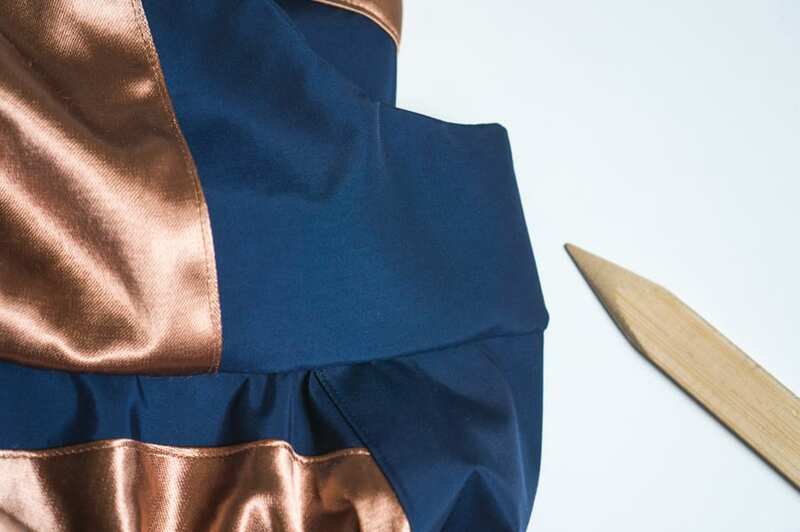 There are just a few steps left to put the finishing touches on your lined Kelly Anorak. 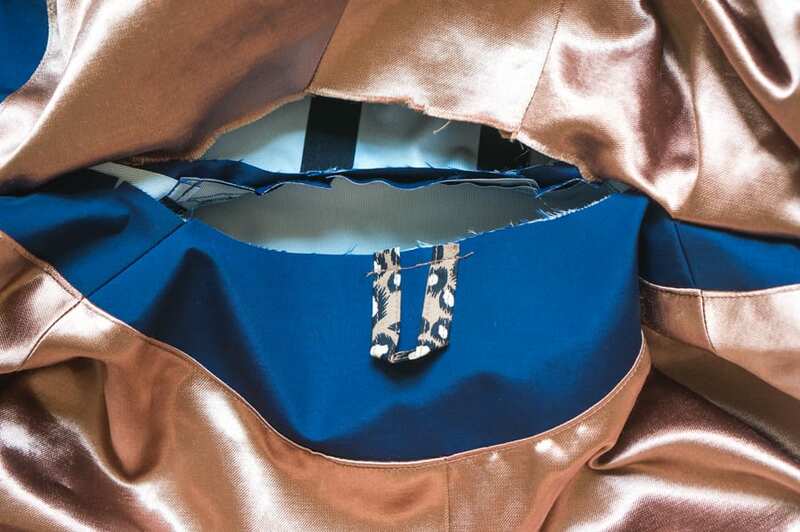 Our drawstring casing is only basted to the outside of the jacket- we need to topstitch it in place to secure it. 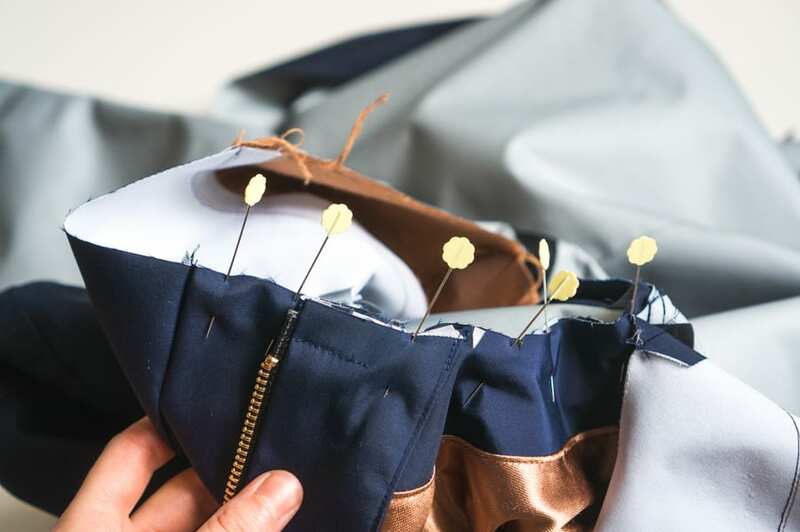 Pin the lining to the jacket where the drawstring casing is positioned, ensuring the lining is lying flat and smoothly against the jacket. Topstitch 1/8″ away from the folded edge of the drawstring casing. 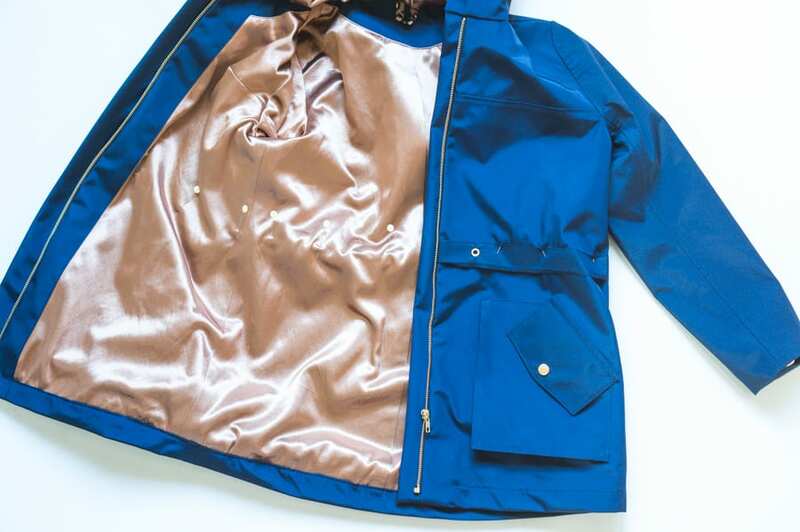 You will sew through several layers: the drawstring casing, the outer jacket fabric, and your jacket lining. 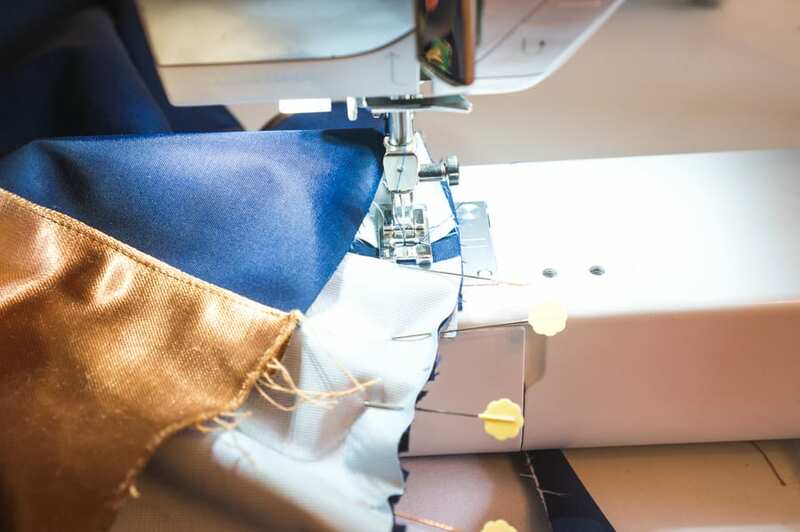 You can carefully unpick your basting stitches every few inches as you sew, to make sure the casing stays in place. 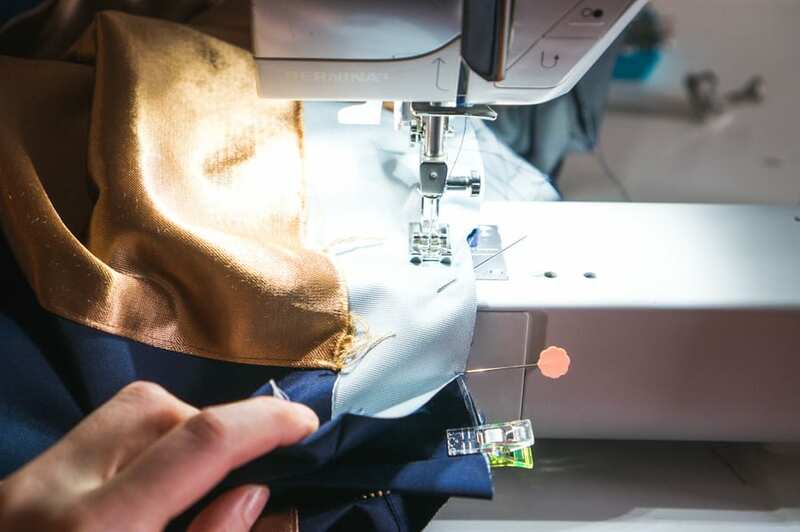 If you haven’t threaded your drawstring through your grommets, do so before topstitching the other edge of the casing in place, otherwise it can be tricky to manipulate. Topstitch the bottom edge as well. 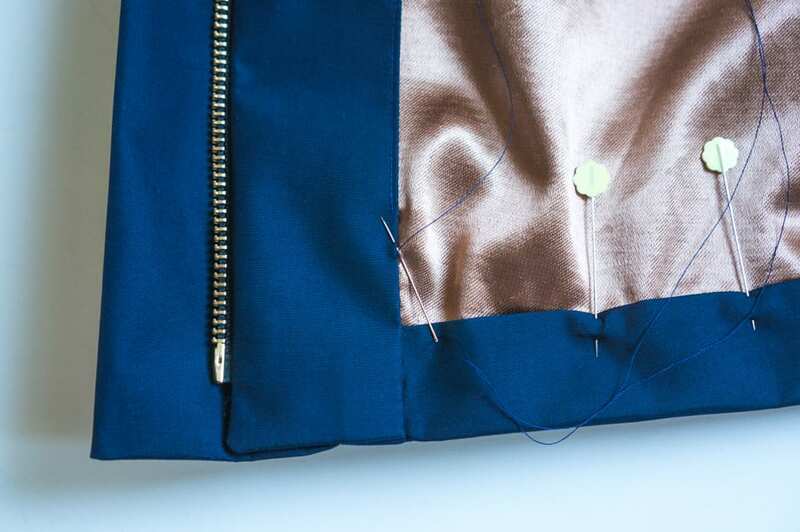 Topstitch the right zipper placket in place by sewing along the inner edge through all the layers. 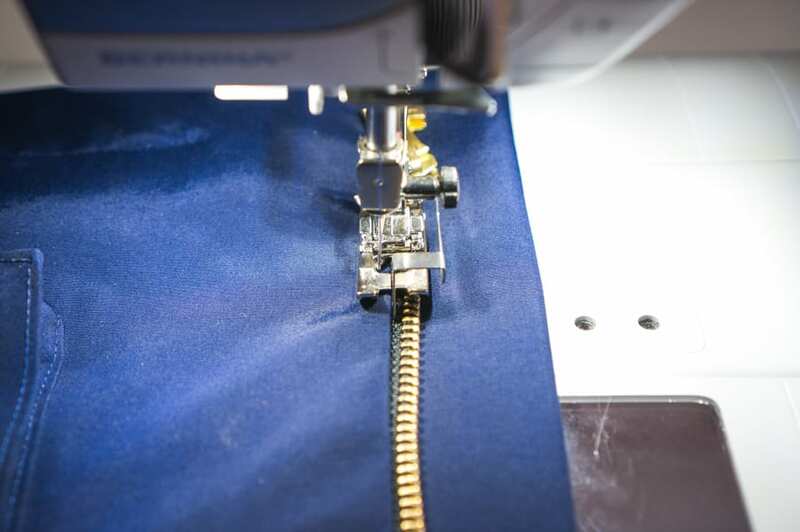 Secure the left side of the zipper in place by topstitching 1/8″ from the zipper through all the layers. 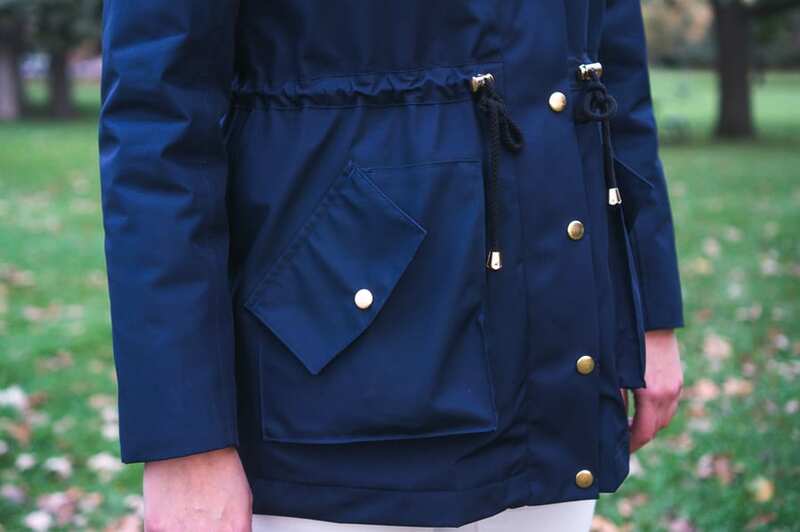 Now you can install your snap buttons and go singing in the rain in your new jacket! See more pics of our lined waterproof Kelly Anorak in action here! 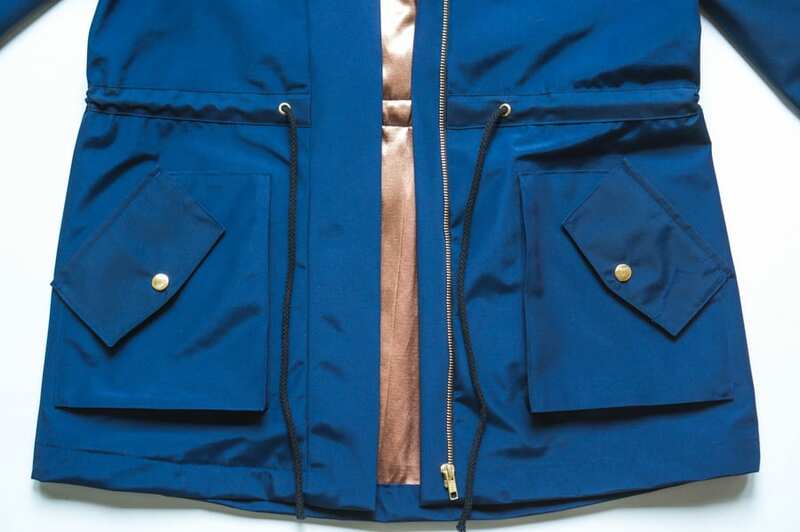 Please note for our blue waterproof sample, we removed the folded flap on the pocket and added a flap to the outside so the pocket would be completely concealed and waterproof. If you’d like to do the same, please note we’ve created a bonus pattern piece with modified instructions. You can download it here.